Boil Kashmiri chilies with white vinegar in some water. When chilies turn to red color, mix with whole coriander and crush. In a cooking pot, heat oil and fry sliced onions until golden brown. Spread fried onion on an absorbent sheet and make sure onion gets crispy. In a bowl, mix a cup of yogurt, crushed chilies, crispy fried onion, salt, ground hot spices, ginger garlic paste with mutton. 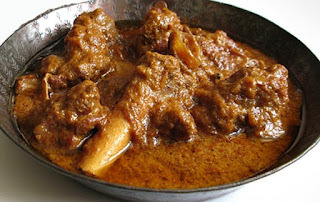 Add marinated mutton to the cooking pot and allow cooking for some time. When yogurt and mutton water has dried up, add 2 to 2 ½ cups of water. Put on the lid and let it simmer on low flame to tender.